The Plant (Sohar-2 IPP) is located approximately 200km northwest of Muscat in Oman, within the Sohar Industrial Port area, between the plot of the existing Sohar-1 IWPP and Sohar Aluminium Power Plant. The facility entered into full commercial operation on 3 April 2013. The Plant consists of two Siemens AG SGT5-4000F gas turbines (GT), two triple pressure heat recovery steam generators(HRSG) and a Siemens AG SST5-5000 steam turbine (ST). The condenser is cooled via a once through seawater system. Seawater is extracted from the existing common intake (shared facility) and discharged to an existing common outfall channel in accordance with the Seawater Extraction Agreement. 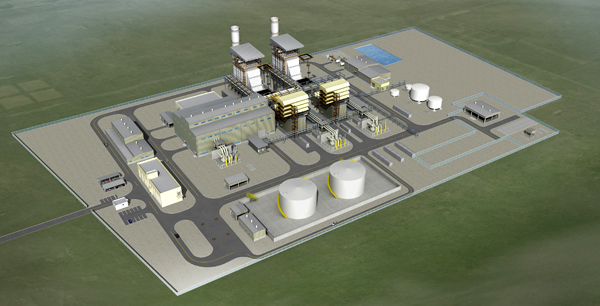 The gas turbines are fitted with by-pass stacks to enable the operation in open cycle. Although capable of open cycle operation, the normal operating mode of the Plant is in combined cycle (CCGT) for higher thermal efficiency. At site reference conditions of 50°C ambient temperature and 30% relative humidity, the Plant has a net power capacity of approximately 744 MW at COD. The Plant is connected to the gas transmission infrastructure owned by MoG and operated by OGC and to the main interconnected transmission system at 220 kV which is owned and operated by the OETC. The Plant is designed for black start operation by means of black start diesel generators which are capable of starting the plant. The auxiliary power for the Plant is derived from the Plant's internal electrical system with back up from the grid. The equipment and facilities required for the operation, testing, maintenance and repair of the equipment (for example control room, laboratory, stores, workshop, etc.) are available on site. Each gas turbine consists of an air compressor, a combustor, a turbine and an exhaust. Air is drawn in from the atmosphere and compressed before it is fed into the combustor. Gas fuel, which is drawn from gas pipelines, burns in the combustor in the presence of the compressed air from the compressor. The gases produced in the combustor, a mixture of high temperature and high pressure hot gases, drive the turbine. The rotational energy of the turbine rotates the alternator, which produces electricity. The voltage level is stepped up through a transformer before it is fed to the grid. Hot exhaust gases from the individual gas turbines are directed into naturally circulated HRSGs, which generate steam at three pressure levels. The high pressure steam from each of the heat recovery steam generators is combined in a common header before passing to the steam turbine. The same configuration exists for the intermediate pressure and for the low pressure steam, allowing maximum operational flexibility. A condensate pre-heater is integrated in the HRSG. This arrangement enables higher efficiencies of the combined cycle power plant, by using the exhaust gas energy to preheat the condensate before it passes to the feedwater pump and into the LP-system. The steam generated in the heat recovery boilers is used to generate additional electricity through a steam turbine (SST5-5000) and a separate alternator. The steam turbine consists of a combined high/intermediate pressure and low pressure turbine. The steam turbine blades provide high efficiency due to an advanced blading technology. The gas turbine and steam turbine generators are of two-pole type, with direct radial hydrogen cooling for the rotor winding and indirect hydrogen-cooling for the stator winding. The hydrogen filled generator casing is a pressure-resistant and gas-tight construction and is equipped with end shields at each end. The hydrogen cooler is subdivided into four sections. Two sections are arranged at each generator end. Capacity: Capacity of a Plant is defined as the total electrical power (MW), which can be delivered by the power plant under specific environmental conditions (site reference conditions). The contractual capacity of Al Batinah Power under the PPA is c. 744 MW . The original net capacity at reference conditions in the original performance test was above 745 MW. This capacity is expected to decline over the period of PPA due to normal degradation of Plant but is expected to remain above c.736.5 MW and meet contractual requirements under the PPA. Availability: Availability is the amount of time the plant is technically capable of generating power as per specifications. As per the project agreements, Al Batinah Power shall be available for 100% of time in summer and 85% of the time in winter. The projected plan nevertheless assumes conservatively that the power plant is in forced outages for certain time. Plant Efficiency (Heat Rate): The efficiency of the power plant is measured in terms of the amount of heat required to produce one unit of power. Demonstrated efficiency of 58% in the original performance test of Al Batinah Power was better than contractual requirements under the PPA. The Plant is operated and maintained throughout the term of the PPA by STOMO. STOMO is primarily responsible for Plant availability, efficiency, power output capacities and operational cost control. STOMO operates the Plant in accordance with applicable environmental laws and is responsible for operating the Plant efficiently, whilst ensuring the correct spare parts are available and that the staff is properly qualified and trained. The O&M Agreement contains provisions for incentives and penalties, at ordinary arms' length commercial terms, linked to achievement of certain availability and heat rate targets. The payment terms of the operation and maintenance agreement are fixed and split into three components (Euro, US Dollars and Omani Rial portions). Pursuant to the terms of the PPA, Al Batinah Power is compensated for indexation in respect of both Omani Rials and US Dollar costs; however, the payments to STOMO designed to cover the long term maintenance contract costs with Siemens AG are in Euro, which means that the Plant is exposed to indexation and foreign exchange risk in respect of the Euro payments. In order to mitigate the foreign exchange exposure in respect to the above mentioned Euro payments, Al Batinah Power has entered into foreign exchange hedging arrangements.